For a long time, I’ve been wanting to figure out a way to generate reports from a SQLite / Spatialite database. For example, I’d like to reach into a database and generate profiles for different places that contain tables, charts, and maps. I know I can use Python to connect to the db and pull out variables. I also learned how to use LaTeX several years back when I revised the GIS Practicum manual, and routinely use it for writing reports, articles, and hand-outs. I finally have time to devote to this, and am going to share what I’m learning in a series of posts. In this post I’ll describe how I got started, and will record some useful projects and posts that I’ve found. In searching the web for building reports in Python, I’ve discovered a number of solutions. Many people have written modules that are in various states of production, from active to defunct. Prettytable was something I’ve used for generating basic text-file reports. It’s absolutely great at what it does, but I’m looking for something that’s more robust. Of all the tools out there, ReportLab seemed to be the most prominent package that would appear again and again. I’ve shied away from it, because I wanted a solution that was a little more general – if that makes sense. Something where every component is not so tightly bound to a specific module. I started looking for a template engine that would work well with both LaTeX and Python. The author had mentioned Cheetah as another engine, and it turns out that Cheetah is often used in conjunction with Python and LaTeX. 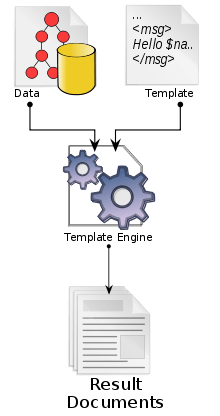 After digging around some more, I discovered another template engine called Jinja (or Jinja2) which I’ve adopted as my solution, largely because I’ve found that the project documentation was quite good and there are numerous user examples that I can follow. Jinja2 allows you to do much more than simply passing variables into the template and rendering it; you have the option to run a lot of Pythonesque code from within the template itself. The slides break down how you can use Python to generate LaTeX reports in several iterations. The first iteration involves no templating at all – you simply use Python to generate the LaTeX code that you want (or if you prefer, Python serves as the template generator). The limit of this are obvious, in that you have to hard code variables into the output, or use string substitution to find and replace variable names with the intended output. In the next iteration, he demonstrates how to use Jinja2. This section is invaluable, as it provides an example of setting the Jinja2 environment so that you can escape all of the necessary characters and syntax that LaTeX needs to function. He demonstrates how to pass a variable from Python to render in a template that you create in LaTeX and mark-up with Jinja2 code (slides 18 to 20). He goes on to show how you can loop through lists to generate output. The third iteration displays how you can pull data out of SQLite and then use Python and LaTeX to generate output. With a little imagination, you can combine this piece with his previous one and voila, you have a SQLite-Python-Jinja-Latex combo. He has a final piece that incorporates screen-scraping using Beautiful Soup, which is pretty neat but beyond my needs for this project. Now that I understand the conceptual model and I have the four tools I’ll use with some examples, I’m ready to start experimenting. I know there will be several additional pieces I’ll need to incorporate, to generate charts (matplotlib) and maps (perhaps some of the Python modules from QGIS). There are some instances where I’ll also have to write functions to create derivatives of the data I’m pulling, so I imagine NumPy/SciPy and GDAL will come in handy for that. But first things first – I need to get the four basic pieces – SQLite – Python – Jinja2 – LaTeX – working together. That will be the topic of my next post. Posted in gothos.info, scripting, series - report writing and tagged jinja2, latex, python, sql, sqlite on March 29, 2015 by Frank.